Oppo today unveiled a brand new Android smartphone from its Neo series (which also includes handsets like the Neo 5 and Neo 5s). Called Neo 7, the new device runs Oppo's Color OS 2.1 (based on Android Lollipop), and has a mirror-like finish on the back. The Oppo Neo 7 sports a 5-inch display with a pretty low pixel resolution for today's standards (540 x 960), while being powered by a quad-core Qualcomm Snapdragon 410 processor clocked at 1.2 GHz. These details alone are already suggesting the fact that the handset will be affordable once it hits the market - though its official price hasn't been unveiled. The new Oppo smartphone features LTE connectivity, dual SIM support, 1 GB of RAM, 16 GB of internal memory, and microSD card support. Moreover, there's an 8 MP camera with LED flash on the back, plus a 5 MP camera on the front (this can use the display as a flash for selfies). 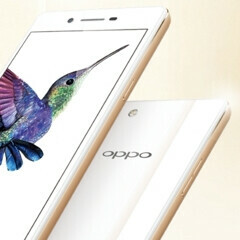 Weighing 141 grams and measuring 142.7 x 71.7 x 7.55 mm, the Oppo Neo 7 includes a 2420 mAh battery. On the official Neo 7 product page, Oppo mentions the fact that there's a US version of the smartphone, alongside international and Indian models. The handset should be released starting the coming weeks. Would you buy one? Moto G beats this easily. Redmi Note 2 destroys them both even more easily. If only it is available worldwide. Ever heard of non availability of International warranty? Front is not so good. These Oppo phones are costlier than the competition with less features. Whenever I see super cheapie phones, all I think of are crooks' throwaway phones on Law & Order. This is a very nice looking device. Has elegant looks for the Gold/White, at least in the photo. It's a very "chic" phone.